It was one of those Cape May days today where you just needed to be in the right place at the right time. Luckily, the business meeting I had today was in the afternoon, so I was on hand at the Northwood Center to be able to respond quickly to a report of a Wilson's Phalarope at Bunker Pond in Cape May Point State Park. At first the bird proved elusive but eventually I found it, fast asleep in the edge of the vegetation on the south side of the pond. Shortly it started feeding and put on a great show for Karl Lukens and I. The bird continued to show on and off until the evening so will hopefully still be present on Friday. Late afternoon watchers also got lucky with a juvenile Gull-billed Tern on Bunker Pond, among the masses of other terns there - I also saw my first juvenile Laughing Gull of the year in the state park. The heat haze today played havoc with the focus and blunted any attempts at real sharp pictures, but the Wilson's Phalarope put on a fair performance for me today. Unlike the other two phalarope species, Wilson's has only slightly lobed toes and spends much more time feeding on land than spinning round in circles on the water. This bird carefully stalked a multitude of tiny flies along the bare edges of the pond [photo by Mke Crewe]. Juvenile Wilson's Phalarope at Bunker Pond today, first reported at 10AM this morning by Chris Takacs. Note the overall very slender appearance, thin, stilt-like bill and olive-yellow legs. This is a rather scarce bird at Cape May Point, so well worth the visit if you want to treat yourself! [Photo by Mike Crewe]. So that's the phalarope - what's the phalaena? Well, Phalaena was an old word that Linnaeus used for all moths when he was classifying insects and I thought I should bring belated attention to the fact that the USA is running its first ever National Moth Week this very week. 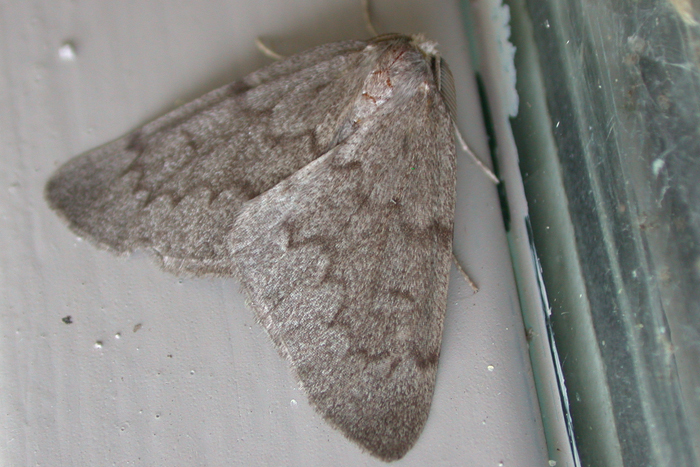 Wherever you are, chances are there's an event taking place near you to celebrate the amazing abundance and variety of our moths, much maligned and much misunderstood creatures. If you haven't already done so, check out the National Moth Week website for events near you and go and see what all the fuss is about! It's been a while since Monkey featured on the CMBO blog, but here he is in the thick of it as we work our way through the trap at our first CMBO National Moth Week event, which took place at my house earlier this week [Photo by Megan Crewe]. One moth of particular interest is this Western Bean Cutworm that was in my moth trap here in Cape May on July 6th and which constitutes the first record for New Jersey as far as we are aware. I noticed that the Cape May County Herald reported one caught at Hammonton in Atlantic County on July 16th, so this species - which is considered a pest species of crops in some areas - seems to be continuing its push to colonize the whole of North America, aided and abetted by crop planting schemes [photo by Mike Crewe]. This is the Cape May Birding Hotline, a service of New Jersey Audubon's Cape May Bird Observatory. This week's message was prepared on Thursday, July 26, 2012. Included this week are sightings of BLACK-BELLIED WHISTLING-DUCK, SURF SCOTER, BLACK SCOTER, LEAST BITTERN, AMERICAN AVOCET, HUDSONIAN GODWIT, RED KNOT, SANDERLING, SEMIPALMATED SANDPIPER, WESTERN SANDPIPER, SHORT-BILLED DOWITCHER, LONG-BILLED DOWITCHER, GULL-BILLED TERN, BLACK TERN, ROSEATE TERN, SANDWICH TERN, EURASIAN COLLARED-DOVE, and SEDGE WREN. A BLACK-BELLIED WHISTLING-DUCK was discovered near the "dogleg" along the north dike at the Brigantine Unit of Forsythe NWR on 7/26. Other recent highlights from Brig include AMERICAN AVOCET and HUDSONIAN GODWIT. 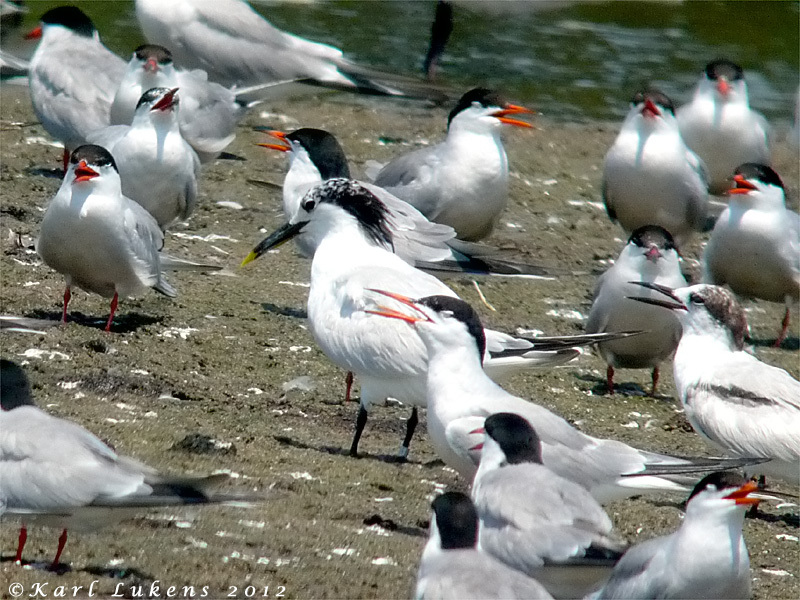 Two ROSEATE TERNS were found at nearby North Brigantine Natural Area on 7/22-/23. A singing SEDGE WREN continued at Tuckahoe WMA this week through 7/25. The bird has been present at the southern end of the driving dike loop. Please note that Sedge Wren is an endangered species in NJ, and that it is illegal to harass this bird or play tapes. Also noted at Tuckahoe WMA recently have been LEAST BITTERN and GULL-BILLED TERN. A WILSON'S PHALAROPE was found at the South Cape May Meadows on 7/25, and the same or another was seen on Bunker Pond at Cape May Point State Park on 7/26. Also found at Bunker Pond on 7/26 were a juvenile GULL-BILLED TERN and a LONG-BILLED DOWITCHER. Several thousand shorebirds were counted at Stone Harbor Point during high tide on 7/20, including 1,255 SANDERLING, 1,180 SHORT-BILLED DOWITCHERS, 1,075 SEMIPALMATED SANDPIPERS, 103 WESTERN SANDPIPERS and 148 RED KNOTS. A SURF SCOTER, 2 BLACK SCOTERS and a BLACK TERN were also noted there that day. 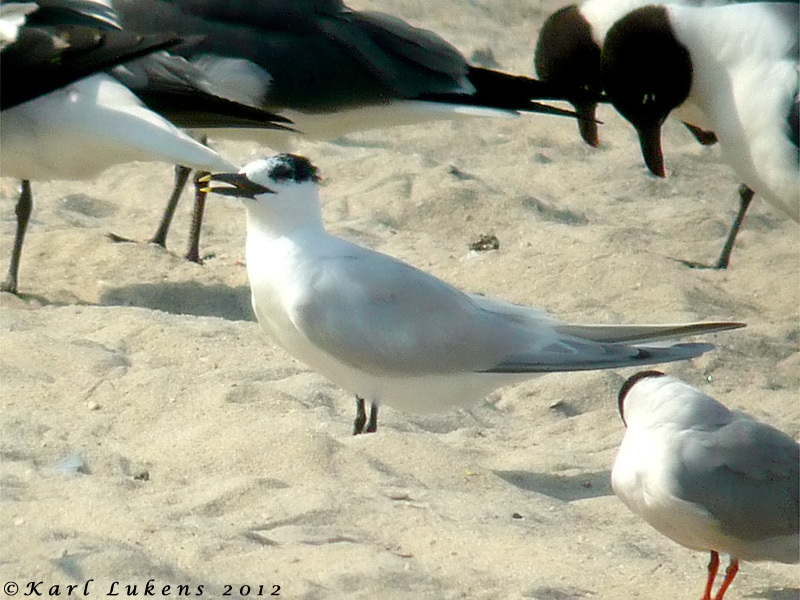 Recent SANDWICH TERN sightings came from Cape May Point State Park on 7/20 and Avalon's 48th Street beach on 7/25. Cape May Point's resident EURASIAN COLLARED-DOVES continue to show regularly, with most reports continuing to come in from the area of Yale, Whildin and Harvard Avenues. Come to where the birds are! Cape May is really starting to buzz with bird activity now. My Wednesday morning walk is my one opportunity a week to get out to the state park and see what's happening there - and there was certainly plenty of action today! At least three Stilt Sandpipers, an Eastern Willet, Spotted Sandpiper, several Short-billed Dowitchers, both Greater and Lesser Yellowlegs and the usual peeps were all on Bunker Pond and we had the nice sight of a party of three Solitary Sandpipers flighting right past the lighthouse. The first juvenile Common Tern of the year was on Bunker Pond too, along with several Black Skimmers and a nice mix of herons, egrets and Glossy Ibises. Young birds are very evident around the Plover Ponds right now with lines of Tree Swallows sitting on the rope fences and parties of Purple Martins in the treetops, with most of them being youngsters getting their wings all geared up for the long southward haul. For full lists of the birds being seen on our regular weekly walks, visit our Field Trips Reports via the link at the top of this page. And why so many swallows gathering here? Well come on down and take a look at the sky - it's full of dragonflies!! Everybody is talking about dragonflies right now, and it's not surprising; from Beach Avenue right across to Sunset Beach, dragonflies are flying in their thousands. Up Washington Mall, all along the beach fronts, even up the Parkway, dragonflies are heading north in huge numbers. So what is happening? These are all migratory species; species that breed in the south then head north once ponds in the hot southern states begin to dry out. The main species at the moment are Swamp Darners - our largest dragonfly here in Cape May County - and Spot-winged Gliders, a reddish-brown species with big, cherry red eyes. 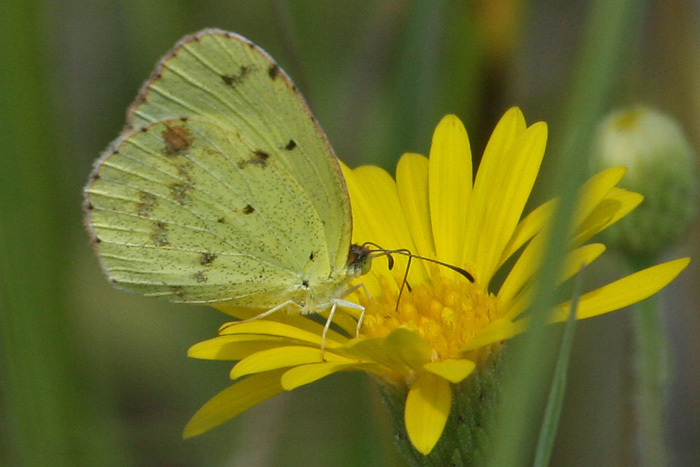 Along with them are good numbers of yellowy-brown Wandering Gliders and a few Green Darners with their bright blue abdomens. Most interesting for me was the surprising number of Comet Darners. In my three years here to date, I reckon I have seen about 10 Comet Darners - I saw at least another 20 just today! Comet Darners are fabulous beasts, they are big, with bright apple green thoraxes and brilliant scarlet abdomens and are really inpressive. Three of them spent all afternoon hawking outside my office window but the most annoying thing is, I don't have a photograph of one yet! These beasties seem always to be on the wing and really don't like to hang around for a snapshot. So what do we think of all these dragonflies - good or bad? Well good of course, because many dragonfly species just love eating mosquitoes! So let's look after them while they are here. They are big and a bit funky-looking but they won 't do you any harm and, just to allay the most common fear, no they won't sting you - they don't have a sting! I sneaked out for a little lunchtime foray today and discovered what I had been missing - Bunker Pond is full of birds! With water levels well down now, there is plenty of marginal mud and good feeding habitat for shorebirds and they are certainly finding it to their liking. Most obvious by far were Least Sandpipers - well over 200 of them, busy on all corners of the pond; but what really caught my eye was a rather spiffy (as Tony Leukering would say!) 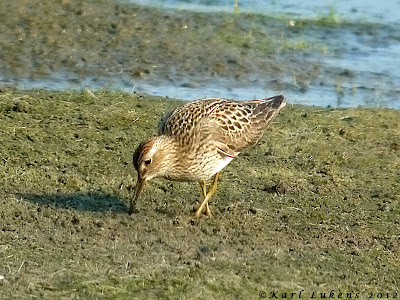 Semipalmated Sandpiper. Why was it so sharp? Well, it was my first juvenile peep of the year. As would be expected, all of the early returning shorebirds are adults, many of them heading back early because their breeding season is over (maybe they didn't find a mate, maybe a high tide washed out a nest, or a jaeger or Arctic Fox caught them unawares). But here was the first juvenile, identifiable by the neat rows of wing coverts clearly on view and not hidden by slightly uneven-looking scapulars. A sure sign that birds really are heading south from the Arctic now. Bunker pond held much else to enjoy too: 15 Semipalmated Sandpipers, 12 Short-billed Dowitchers, three Semipalmated Plovers, five Lesser Yellowlegs and a Pectoral Sandpiper were all there to be enjoyed, as well as Black Skimmers, a Ring-billed Gull and an assortment of Common and Forster's Terns in all manner of confusing plumages! Recent CMBO walks continue to get good counts of shorebirds at the South Cape May Meadows too - in particular, you might try our evening sunset walks there as migrant Virginia Rails are starting to appear now. The South Cape May Beach still has late broods of Least Terns and up to 11 Lesser Black-backed Gulls to enjoy. 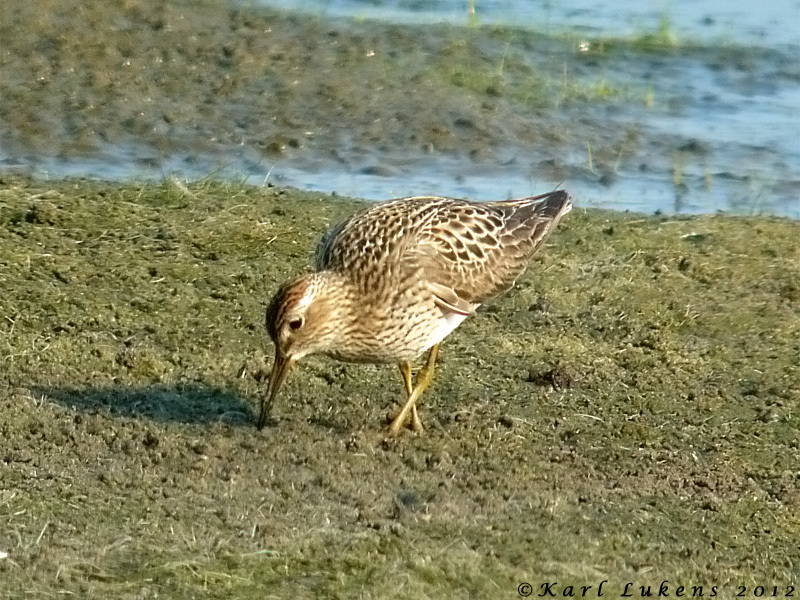 Small numbers of Pectoral Sandpipers are making their way through Cape May Point [Photo by Karl Lukens]. It's prime time for Sandwich Terns at Cape May now - this bird was on Bunker Pond on 17th [photo by Karl Lukens]. I guess most people think of September when they think of warbler movements through Cape May. And those people would be correct of course. But it may come as a surprise to most to hear that warbler movements have already started at Cape May Point. Scott Whittle texted last Saturday that Yellow Warblers were calling over the point and this was certainly the case on our state park walk this morning too. Both Yellow Warblers and Bobolinks have been moving in small numbers these past few days, but the arrival of these colorful waifs was even more apparent last thing this afternoon when two Yellow Warblers, a Prairie Warbler and an American Redstart were bobbing around the birdbaths at the Northwood Center - all new arrivals during the course of the day. Cape May Point State Park was certainly producing some great birding this morning, especially around Bunker Pond. Solitary, Stilt, six Pectoral and assorted Semipalmated and Least Sandpipers, Semipalmated Plover, two Willets, 12 Killdeers and plenty of Short-billed Dowitchers and Lesser Yellowlegs, all there to be studied at close range. Great Egrets and Great Blue Herons are increasing in number and Glossy Ibises and Black-crowned Night Herons were seen this morning too. Eight Royal Terns and a Lesser Black-backed Gull on the beach all added to the variety - the birds are here! Signs of warbler movements can even be apparent up in Belleplain State Forest. This male Hooded Warbler fed close to me for several minutes and, though this species breeds in Belleplain, this bird was in an area that I know well and have not seen this species in before. Nearby, I also ran across a feeding party of several Pine Warblers, Black-and-white Warbler and an American Redstart [photo by Mike Crewe]. This female Bar-winged Skimmer posed beautifully on a greenbrier stem for us, showing off a wonderful color-coordinated body and those smart, black-margined wings. Bar-winged Skimmers are rather localized in Cape May and can mostly be found in the top third of the county. [photo by Mike Crewe]. Always a show-stopper! A male Widow Skimmer - just one of some 20 individuals that we saw of this relatively recent colonist to our area [photo by Mike Crewe]. Insects have certainly been the main focus of our wildlife walks this past week and one particular little beastie that has come to our attention has been a red-and-black species known as a Cow-killer - sounds ominous doesn't it! Cow-killers are a large member of the group known as velvet ants. These insects are not actually ants, but wingless wasps and as such they have a sting in their tail. The reason for the strange English name is that it is said that the sting is so powerful it can kill a cow, and that being stung by one is akin to being shot! I am not sure whether this is really the case, but I do have a healthy respect for them! Look for Cow-killers anywhere on open ground, and look for a bright red and black thing that looks like a very busy ant. There are a number of other velvet ant species, most of which are similarly-colored, though often more orange in appearance, but none are as big as the Cow-killer, which can get up to an inch long. Females lay eggs at the entrance to bumblebee nests and their larvae are parasitic, crawling into the nest and eating the bumblebee larvae. Female Cow-killer - an awesome beast! Stories of killing cows appears to be scientifically unfounded, but I'm not going to be the guinea-pig!! Keep an eye out for these interesting insects, but don't be worried by them, they are perfectly happy ignoring us and are extremely unlikely to sting you unless you really annoy them [photo by Mike Crewe]. Hayhurst's Scallopwing on our dragonfly workshop yesterday. This may be the classic 'little brown job' but it's an interesting butterfly and never easy to find in Cape May County, so it's always a nice bonus to a day in the field [photo by Mike Crewe]. Late afternoon light shining through the wings of a Viceroy - our butterfly workshop will help you easily learn how to tell this species apart from the Monarch butterfly [photo by Mike Crewe]. It could be a good year for the Little Yellow as several have been seen already around Cape May. This southern species moves its range northward periodically and can occasionally be found in good numbers when conditions are right [photo by Mike Crewe]. Shorebirds are still in the news as numbers swell around Cape May and wetland habitats are certainly the place to be right now. Top prize in the area at the moment would be the two Black-bellied Whistling-ducks which have so far spent two days at Brigantine and this site also still has a summering Dickcissel and White-faced Ibis. A good variety of herons, egrets and ibises continues to build up and the Great Shearwater may well still be lurking off the point if you fancy a nice day on the beach! Southbound shorebirds and wandering seabirds continue to be in the news on the various information lines at the moment. I heard from Clay Sutton that Heislerville is really busy with shorebirds right now, with his latest counts including 3,000+ Semipalmated Sandpipers, 1,600+ Short-billed Dowitchers and 502 Lesser Yellowlegs - the latter count easily surpasses Clay's old fall record of 200! Eastern Willets seem already to have mostly shipped out from the backbays and tern numbers are gradually building down at Cape May Point, among them a Sandwich Tern and two Roseate Terns today, while Lesser Black-backed Gull numbers have so far peaked at 11 on South Cape May Beach. Two Wilson's Storm-petrels were feeding in the bay this morning and a Great Shearwater - presumably the same bird - was reported by Tom Reed, this time seen sitting just offshore from the state park. A run through our Field Trip Reports should give you a good insight into the shorebirds and other waterbirds that are steadily increasing around wetlands at the point; perhaps most surprising is the appearance of a second American Coot. Solitary Sandpiper and Little Blue Heron are sure signs of fall advancing, as are the little groups of Sanderling that are starting to show up on the tideline now. Sandwich Tern at Cape May Point this week [photo by Karl Lukens]. Songbird migration is not hugely in evidence as yet, but small numbers of Bobolinks are certainly making their presence known overhead during several of our recent weekly walks and Karen Johnson tells me that numbers of Ruby-throated Hummingbirds are starting to build up at her feeders up in the north end of the county. 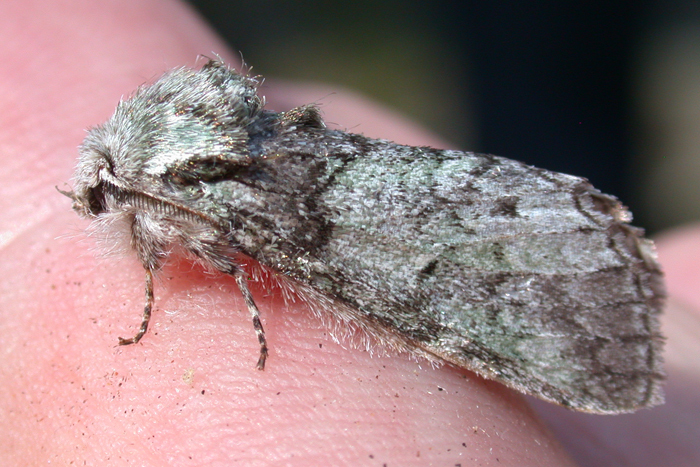 I struggled with this moth at the time as it isn't in the new moth guide to our area. However, an internet search eventually led me to Nepytia pellucidaria, a species which is poorly known but which is perhaps the most likely member of its genus to occur in our area. At least five were at the light today [photo by Mike Crewe]. Moth species that disguise themselves from predators during the day by looking like pieces of lichen and blending in with their surroundings are very common in woodland areas. This Mottled Prominent was one of two seen at Belleplain today and behaved very obligingly for the cameras [photo by Mike Crewe]. Our best find of the day, simply because it is so crazy! This strange beast, looking somewhat like a dragonfly with silly antennae is known as a Four-spotted Owlfly (Ululodes quadripunctatus). I guess they are called owlflies because they have very hairy heads and thoraxes. They are actually quite closely related to Ant-lions - those insects that build those little pits in the ground when they are young, to capture ants. 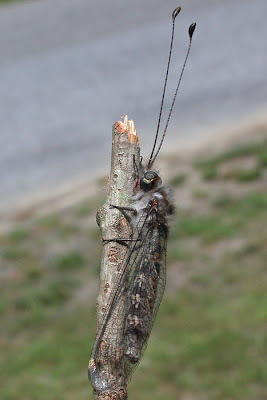 Owlfly nymphs are very similar to Ant-lion nymphs, but they roam freely through the leaf litter and don't build pits [photo by Mike Crewe]. 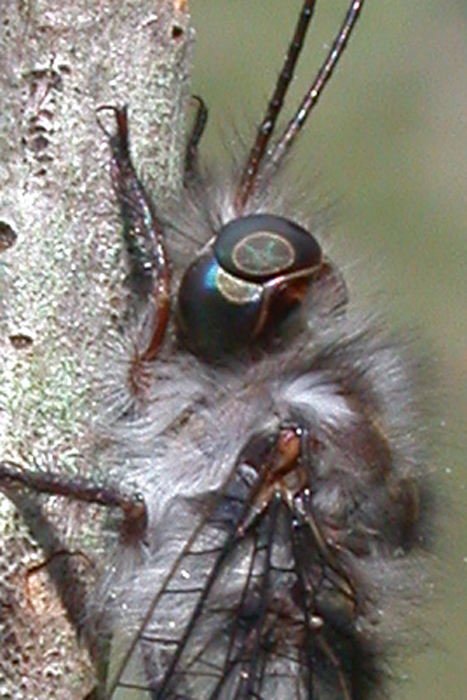 A real close-up reveals one of the most peculiar features of owlflies - their split compound eyes! This individual looks as though it has its head turned to show the top, where the two eyes meet, but in fact this is just one compound eye and it has that curved split across the middle; I can't begin to imagine what sort of a view of the world this gives the creature...[photo by Mike Crewe]. At least three American Avocets recently turned up at Brigantine but I have heard of no further sightings of the Ruff reported from there a few days ago. The Dickcissel continues at Brigantine and a steady trickle of early migrant shorebirds and Glossy Ibises continues though our area. At Cape May Point, Saturday's CMBO walks turned up the first Pied-billed Grebe and juvenile Little Blue Heron of the fall, while Don Friday had a surprise visitor to his yard in the form of a Pine Siskin - keep an eye out for those strange goings on in your back yard - one of my regular correspondences has two young Green Herons regularly visiting his birdbath in hot weather in Lower Cape May at the moment! There's been a few strangers at the point of late... "Strangers?" I hear you ask. Well, birds that are not quite so expected here right now. Even in mid summer, it seems that the old Cape May magic weaves its spell and draws in those oddball wandering birds! Today, our Walk for All People at the state park turned up a Merlin, which was chased off by the local Red-winged Blackbirds - clearly they thought that this bird should not be here at the moment either! The American Coot that showed up last week also still lingers on the east half of Lighthouse Pond (though it is likely that this bird has been around since last winter when we had unusually high numbers of this species, it's just been hiding somewhere out of view) and a Great Shearwater was again off the point - presumably the same bird as seen on Tuesday. Up to three Mississippi Kites are wandering the point and, though mostly in some distant corner where we can't find them, they do seem to appear from time to time over the Rea Farm, so that's my tip for a location if you want to see them! These birds are more typically birds of spring here but, as this species continues to push its breeding range north, I guess we can hope to see them more regularly in future. A Sandwich Tern and three Lesser Black-backed Gulls were reported from the South Cape May Beach on 2nd, while Stone Harbor Point and nearby Champagne Island have recently hosted up to 58 Royal Terns, seven Lesser Black-backed Gulls, single Sandwich and Black Terns and a summering Surf Scoter. Black Tern and Whimbrel were reported from The Osprey boat trip on 5th and there was a small, early movement of Bobolinks over the point this morning. Pete Dunne's monday morning walk at The Meadows turned up a nice surprise today with a Great Shearwater cruising the calm waters off the South Cape May Beach. A good hour later, the bird was still present and feeding actively among all the gulls and terns that were busy catching fish in The Rips off Coral Avenue. Oh for a small boat so as to be out there to get real frame-filling shots of this fabulous seabird! While we were watching, a small fishing boat was cruising back and forth among the birds and passing within just a few yards of the shearwater! Great Shearwater (left) with Laughing Gull for size comparison. It is amazing just how big a lens you really need to get close enough for good shots of birds - or how close you have to be to the bird! This shearwater looked magnificent through a scope and at times I could even see the sun glint in its eye - and yet a 400mm lens wasn't really enough! Here though, you can see the dark-capped look, pale neck collar and typical underwing pattern of a Great Shearwater [photo by Mike Crewe]. From above, the same head pattern is visible on the Great Shearwater and it also shows a narrow white rump patch, dark tail and a dark outer wing with contrastingly pale secondaries [photo by Mike Crewe].